Do people underestimate you? Are you seeking the power of silence? Is mindfulness a mystery to you? 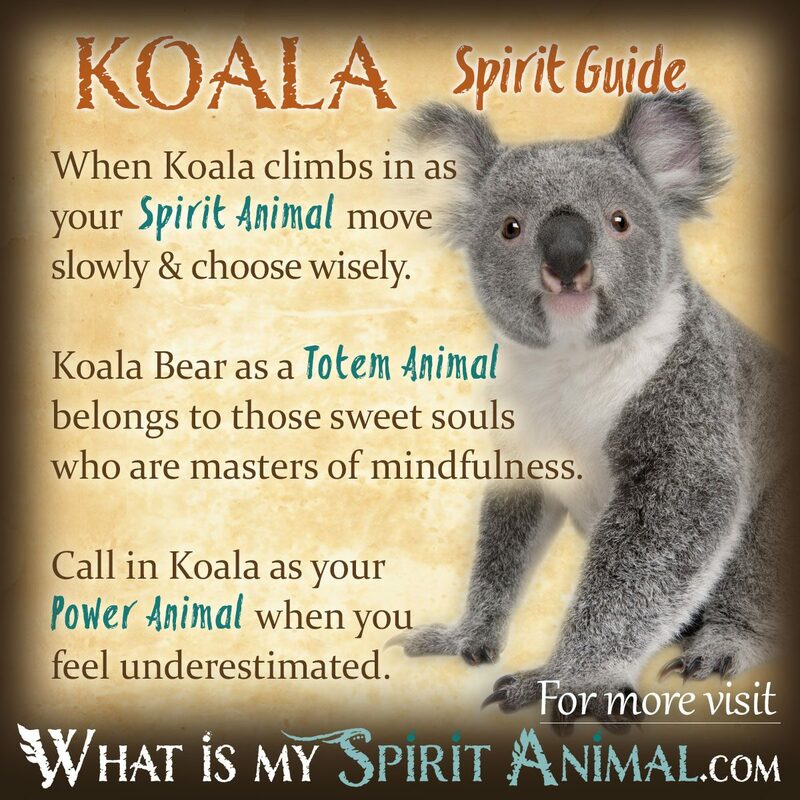 Koala Bear as a Spirit, Totem, and Power Animal can help! Koala teaches you how express your keen intelligence all while maintaining your energetic balance. Delve deeply in Koala symbolism and meaning to find out how this animal spirit guide can enlighten, educate, and stir you! How can anyone resist the charms of Koala? They exude delightfulness through their whole Be-ing. Koala is a very “chill” creature. There is nothing in this Spirit that remotely speaks of stress. Mind you the euphoria of Eucalyptus leaves and a slow metabolism doesn’t hurt! In some respects, this lifestyle makes Koala Bear a shaman who uses nature’s gifts to improve their daily existence. Koala seems perpetually at peace with himself and his surroundings. That, in itself, is a powerful life lesson for most humans. Koala Bear medicine is strongly connected to the Earth element. When Koalas have young, they burrow in the dirt, while the baby is safely ensconced in a pouch. While we think of Koala as reaching high into the trees, the Earthly connection remains a powerful one. Myths tell us that it was Koala who used clay as a means of bringing wisdom to the early humans. We were also fortunate, learning tree-climbing from our friend bear’s aptitude. Perhaps one of the most important aspects of Koala Bears is that they remember the time-before-time. They carry a genetic memory of primeval ancestors and mysteries. To this day Koala climbs toward the heavens watching and waiting for the sacred Ancients’ return. From this vantage point they protect self while honoring nature. Koala Bears are marsupials that embody a natural maternal nature. Her children stay close with her. The pouch of Koala mom represents life-giving energy. This spirit animal is born near Earth, and shall, like all of us, return there at the end of days. As Koala evolved, they turned toward the trees more readily as a means of adapting to environmental changes. In nearly all esoteric symbolism trees are a bridge between the Earth Mother and the Sky Father. This makes Koala a walker between worlds, bearing wisdom from the Heavens when they return from their journey. It’s a fact that stress and anxiety decrease joy in our daily lives. These negative energies also wreak havoc on our body and aura. Koala Bear is happy to sleep 20 hours straight if they wish. Now where is that hammock again? Koala Bear medicine advises bringing calm into your stormy life. Take time to really enjoy the moments and small things. Meditate, breath or just take a quiet walk with Mother Nature. Koala Bear as a Spirit Animal also reminds us that your home should feel like a haven. If there is chaos or anger in your home, it’s time to make peace. Extend your natural insight and find a way to bounce those negative vibes right out of your tree house. Sometimes, Koala Bears appear to parents to help them guide their young. Not everyone is a “natural” when it comes to having children. Koala has strong tribal instincts that support you through your learning experience. It will take time, but then again – you were told to slow down a bit! Additionally, when Koala Bears are born they’re about the size of a Bee. This, of course, makes Koala joeys super vulnerable. But, by taking one step at a time, Koala mums help their little ones grow to be strong and independent – very independent. While it might seem a bit heartless to humans, Koala mums ‘cut ties’ once their Koala kids can ‘stand on their own two feet’. Given the millennial generation’s hesitation to claim their own strength and independence, Koala as a Spirit Animal could help quite a bit. As an animal spirit guide, Koala’s greatest senses are hearing and smell. Thus having Koala appear in your life could presage the development of psychic gifts. Pay attention – see what your ears and nose tell you. If you were born with a Koala totem you are probably a “whatever will be, will be” kind of person. It takes a lot to rattle Koala. This totem resonates with friendly, welcoming energy. Additionally you have a natural capacity to protect what you hold dear. Those who carry Koala medicine in their soul can calm down the fussiest child and the most chaotic crowd. Whenever you are around people, they simply relax into your peaceful aura. It’s interesting to watch this effect. The next time you see a friend at home and you know they’ve been having a tiff with family, observe how your presence changes the dynamics. You offer stability freely. Just don’t let that be abused. Koala people are a bit dreamy in nature. This is the way Koala puts their ducks in order. You have a rich fantasy life and a keen mind. You may experience vivid dreams, or “waking” dreams to which you should pay attention. These often bear important messages for you or others in your Tribe. Your wistful nature attracts you to things less concrete and more fluid like poetry or interpretive dance. Overall your Totem drives you to live here and now, devoting your senses to the pleasure of that moment. There are many reasons why you might call on Koala Bear as a Power Animal in your mystical or mundane life. Women who are coming to term in a pregnancy might find Koala energy makes a great midwife. Folks who suffer from tension related conditions can reach out to Koala for a soft, energetic massage that brings your chakras back into balance. If you struggle with keeping focus during mediation, Koala is your go-to Animal Guide. This being also supports calming activities like deep breathing or yoga. Overall Koala is the eye of the storm in life, maintaining peace. The myths of Koalas tell us that they brought knowledge and survival arts to humankind. So if you are entering a new level at school, Koala may bring you that mud of keen-mindedness you need. Alternatively if you feel exposed or in danger, let Koala protect you and instruct you in staying safe. The vast majority of Koala meaning and symbolism comes to us from Koala’s native stomping grounds, Australia. It is one of the most popular symbols of this nation. Some stories claim that Koala has no need of water, which is why the Aborigine name for Koala translates as, “no drink”. One story of the Dream Time tells us of Koala hoarding water. At this time he had a tail that he used to hang from a tree, drinking his water from below. When caught, Koala ran off so fast that he forgot his long tail, which remains absent to this day. Ritualistically the Aboriginal often used Koala for food, but not in a way you think of for supper. They would cook it skin and all, honoring the animal throughout the process. By so doing, the Aboriginal people trusted that Koala spirit would share his water, and drought would never return. Another Dreaming story claims that parts of the Koala created a bridge to a new homeland. This story endeavors to explain how the “others” came from a far off place to find safety on Australia. From this group, whole villages formed and grew together. As it turns out Koala is a social creature. They find a group with whom they eat and bear young. However, they protect their territory with ferocity unexpected from such a sweet looking creature. In this Koala represents hearth, home, family, kin and neighbors working together for a common good. In nature Koala is a tad picky. While he has hundreds of varieties of Eucalyptus from which to choose, only 10 types are considered “gourmet”. Of that, sometimes only 2-3 might be consumed. Koala uses balance and strength to gather his chosen goodies. This adds the symbolism of equilibrium in our lives. Add selective eating habits to Koala’s list of charms. Koala medicine includes protection from the elements and the environment. Their fur is like wool that keeps their body temperature relatively consistent. The fur also repels raindrops akin to an umbrella. Beyond this they have a rather dense back side that makes sitting on branches comfortable. This animal spirit is more active at night. Koala likes the dark as it helps him maintain hydration, which is precious in a hot environment. During the night Koala enjoys eating, visiting his herd and cleaning himself. So, when you walk with Koala don’t be surprised if your nocturnal adventures increase. Koala has a large vocabulary and the ability to project their message over a long distance. One good shout and other Koalas can locate the caller. When frightened, they cry and when speaking to their young, they click. Here, we are reminded of the importance of finding our voice, and using it effectively. Dreams about Koala Bears often, well, ‘bear’ a message about your spiritual Path and awareness. Additionally he presages a time of security and protection, when you should take time to nurture your Higher Self. Move away from the chaos of the mundane world and enjoy some peace and quiet while meditating on Spirit. Learn more about Koala Bear Spirit by reading Koala Bear as a Dream Symbol on WhatIsMySpiritAnimal.com! In the Australian Zodiac, the sign of the Koala runs from June 21 to July 23. People born during this time are said to be tied to the Moon, and have amazing tenacity. There is some internal conflict, however, in that Koala’s head and heart often end up in a tug-of-war.